I looked at the yose page and found some great advice to learn to calculate the value of the yose moves (slowly, in several years). It seems to me that I have played the game for ages and yet learning the skill of yose calculations is constantly postponed. I think that you would agree that yose is usually played by tired players. I, for instance, don't usually have stamina to start making necessary calculations. Moreover, the calculations have to be performed fast. Yet, I know that I did not actually do my homework on yose, I am not prepared and I don't know the values of the basic moves. 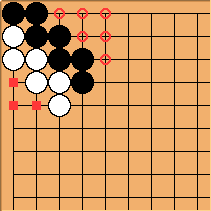 Moreover, quite often I am not even concentrated enough and let points go because I don't see the moves. It seems that the result of the games fluctuates quite significanlty in the endgame. And yet, I have an impression that my performance in yose is not that bad and quite often I gain a lot at this stage of the game. Could it be that my opponents are even worse. Of course, some are better than me but most are not good at all. I don't know the values of the moves but I don't reply automatically at least. 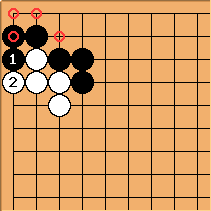 So, I would like to make myself a library of some most common yose moves. I think that if you know what is the value of some moves your task is simpler because you'd be able to miss that part. I believe also that a library like this will be most useful for the person that compiles it. Actually, the most important task is to learn the way the calculations are done. It seems that once you've made some calculations then have a certain know-how. 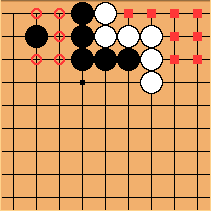 Black has 6 points, White 3. The score is +3. 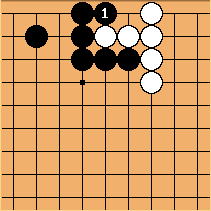 White has a one-point ko-threat at a. is the correct reply to . Thus we have to conclude that the position has a 0.5 value (miai counting). One has to be a ko master to get an additional point playing at a. Here b serves as a one-point ko-threat. BillSpight: A play at a has the same value as playing a ko where the ko stones are the only thing at stake, 1/3 point (miai). If White plays first, through Black has 2/3 point in the corner, one point for the captured stone minus 1/3 point for the stone in atari. If Black plays at instead, he gets one point (at ). A net difference of one play makes a difference of 1/3 point. Black a brings it to a zero position. Score +3. As the result White has 7 points, Black 1. The score is -6. The average local score is -1.5 point with the value of a move 4.5 point miai counting. This is the first large result and I don't have anything to make comparison with, but it can serve as a reference point. White a raises the local temperature to 4.5 points. Black a makes the score equal to +6 with 0.5 point temperature. White a reduces it to -1.5 position with 4.5 temperature. Now, I don't know how to count here. The value of the move cannot be less than the temperature of the resulting position, right? So it is 4.5 points miai counting. 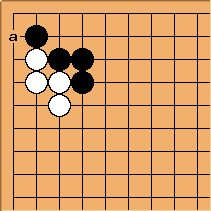 Black a increases the score to 6 points and cools the position down to 0.5 point. White a makes the score equal to -1.5 points while keeping the temperature high (4.5 points). So, average local score is 2.25. A move at a increases it by 3.75 but it is not symmetrical since White's move keeps the temperature high. BillSpight: On the reasonable assumption that White has territory on the left side (as marked above), after Black a, Black will have a one-point sente play to make inside that territory. In that case at a is a fourpoint sente play for White. The value of a sente play is the difference between the position after the sente and reply and the position after the reverse sente. After the reverse sente (marked), - is Black's sente. The reverse sente picks up the three marked points plus the point at . Can one say that if the temperature is not the same after the move the move is considered sente/gote? Sente is a relative notion after all. BillSpight: Sente has more than one meaning. In the local sense, raises the temperature, and Black should respond. However, since it raises the temperature only by 1/2 point, it is not hard to construct whole-board positions where White should play but Black should then play somewhere else and let White continue locally. White can play . 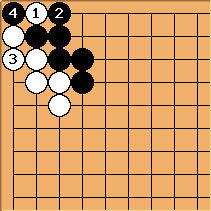 After and Black cannot connect. He will have to play on the marked point and then White can fight a two-point ko. Actually what I am interested in is not a 1-2 point yose. It is not easy to get much gain from that. 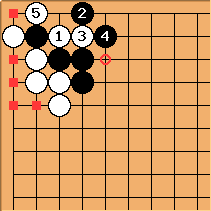 But a big yose play, when the untrained eye does not see the difference between six-point moves and eight-point moves. Being able to play this correctly would make difference in a game. BillSpight: In modern (post 1900) pro games you see occasional game-losing yose errors at around 3 points. Errors that lose a point or two but not the game are fairly frequent. You are right that the important yose to get right are the medium and large yose. This relates to your point earlier about having time to calculate (estimate) the size of yose. High-level go games of 200 - 300 years ago had very few yose errors. The pace was slow and they took the time to work plays out. In my experience, the time to figure the (approximate) size of yose is when you tenuki. After all, the main reason to play somewhere else is that it's a bigger play. (The proverb about urgent moves before big moves is really about seeing how big the urgent moves are.) So when you leave an area you already have some idea of how big it is: not big enough. Take a few seconds and ask, What is my follow-up here? What is my opponent's follow-up? Local sente or gote? Compare the results and estimate the size of the play. You will usually be within a point or two, which is usually good enough to order plays reasonably well. By the time you come back to consider the play, the surrounding conditions may have changed the size of the play substantially, but usually your original estimate is good enough. Don't wait until you are tired to make these calculations. Of course, novel positions will arise, but you will already have a good idea of the size of many plays. :-) In addition, such calculations will help you assess the state of the game. White has 8 points, Black 5, score is -3. After , - is sente. If White replies at , she gets a point at , so it is a one-point sente play. If White plays at 1, she gets two points at and . 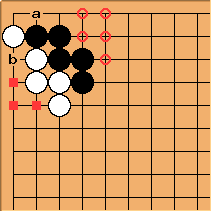 By comparison with a white play at 1, Black 1 gains two points in gote or one point in sente. Both alternatives yield the same miai value: is an ambiguous move, with a miai value of 1. But the question about the temperature remains. The value of the move is bigger than in the case when white had a stone at b. After there is only a dame left. If White plays at she makes one point. So this is a 1/2 point gote (miai). The most difficult thing about this is the inability to reduce it to known positions. Reviewing one's own game one comes to some conclusions. They might be obvious for others but the mistakes are made. 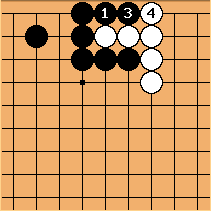 The move value in this position is 1 point miai counting - is it?